After what seems like ages, Verizon is finally set to officially roll outs its LTE (Long Term Evolution) network that promises to leave 3G in its dust when it comes to speed. LTE has been the 4G technology most people have been dreaming of as it offers five to 12 Mbps per second on the download, and two to five Mbps on the upload, speeds that most people don’t even enjoy on their home cable Internet connections. With these sort of speeds you will begin to see the mobile Web taking on a whole new dimension as it may become truly seamless for you to use the Internet on the go. Despite the fact that Sprint’s WiMax 4G network has a huge head start on this LTE network, the latter is becoming the international standard for next generation mobile broadband networks. Phone manufacturers alone may end up pushing for LTE to become the accepted standard here as that would mean less handsets for them to build, something every company would surely appreciate. While the current rollout focuses on major cities, Verizon is saying that due to the use of the 700 MHz band, deployment of LTE is a rather speedy process. Although they are currently focusing on major metropolitan areas right now, rural deployment is not too far down the road. 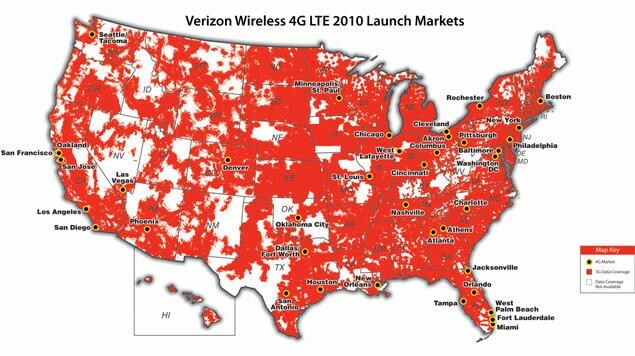 “Our plan is to deploy 4G aggressively across the U.S. In fact, by 2013, we’ll have full nationwide coverage everywhere we have 3G coverage today,” said Sheldon Jones, Public Relations Manager for Verizon Wireless Philadelphia-Tri State Region. Below you can see a map of the launch cities (click for a larger view) plus a list of cities and airports that will be receiving the LTE coverage first. What say you? Are you excited for LTE?